On a recce trip to Skye scoping new rock walls and giant stones, we stopped off at the Lagan burn to quench gargantuan thirsts. I stared again at the Duck boulder, trying to squint its erratic-topped form into a duck (failing again - it looks more to me like Tom Weir's hat with a bobbble on it). 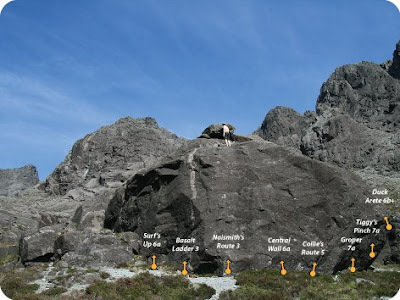 We meandered up the classic lines - I had forgotten how good these highballers actually are - all possible in the heat due to the rasping friction of the gabbro. Here's a short topo and descriptions for anyone wanting to stop off on the way down from the Cioch Face. This the giant walled boulder with smaller duck-like erratics perched on top. It has a superbly textured high wall over a gravel apron and is accessed via the Lagan burn on the path to the Cioch face. Historical and used as a warm-up wall ever since Naismith and Collie roamed the corries. All problems feel quite highball but ease with height - imagine you are in tweeds and hobnails! The far left sloping bulges through the small roof at the top on improving holds. 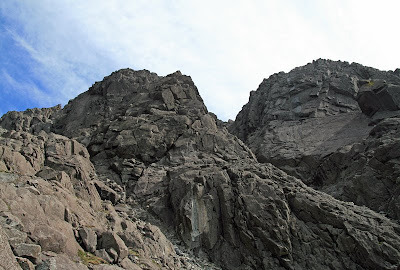 The excellent basalt seamed groove of the left arête following the feature to the top. 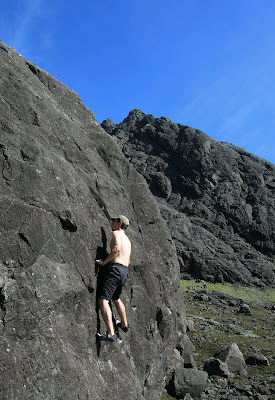 Climbs the ledged rock groove on the left above the gravel apron on polished holds. Blame Willie Naismith for polishing the rock with hobnails in the 1800’s! The tricky left central wall has a problem-solving finger-slot left of the thin crack holds in the crux bulge. Pull up into the right hand groove just left of the overhang, finish direct. A classic highballer! Named after Skye pioneer Norman Collie. Sit start the overhang low left and follow the edges right to lunge to the bra-shaped hold, then finish lengthily through another sloper up right. 6c standing start. A couple of metres left of the right arête. Difficult pinching leads to a lip hold, further pinching might gain the big jug. Niall McNair c 2005. The right arête. A long stretch to get started, but good holds gain height and a slap for the sloping bulge to the right allows the trucking slab to be gained. The ‘duck’ on the top has a flying arête, sit start this with dynamic throws & mantel out the lip. Traverse from Collie’s Route to finish up Naismith’s. I lost some photos of the Bloody Stone, so if anyone out there has pics of this giant boulder in Harta Corrie, please get in touch!